Use a nylon coupler to walk two dogs at once. 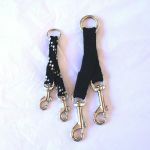 Connect your leash to the ring and the other two ends to your dogs' collars. Couplers can also be adjusted for length. You may not want both to be the same length if you'd like one dog to walk slightly ahead of the other. Available in 3/8, 3/4 or 1 inch widths in an assortment of colors. Use a poly coupler to walk two dogs at once. Connect your leash to the ring and the other two ends to your dogs' collars. Couplers can also be adjusted for length. You may not want both to be the same length if you'd like one dog to walk slightly ahead of the other. Available in 5/8 inch widths in an assortment of colors. 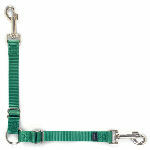 Use a latigo leather coupler to walk two dogs at once. Connect your leash to the ring and the other two ends to your dogs' collars. Available in 3/8, 1/2, 5/8. 3/4 or 1 inch widths in black or burgundy. Available in nylon, poly or leather in an assortment of colors.